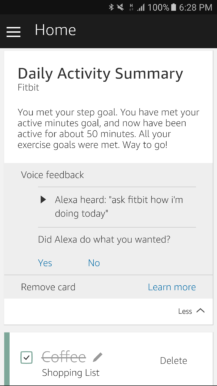 Amazon's Echo success took me a little by surprise. It seemed like we went overnight from questioning the idea of a voice assistant in a speaker to almost everyone owning an Echo and companies rushing to add Alexa support for their services and products. 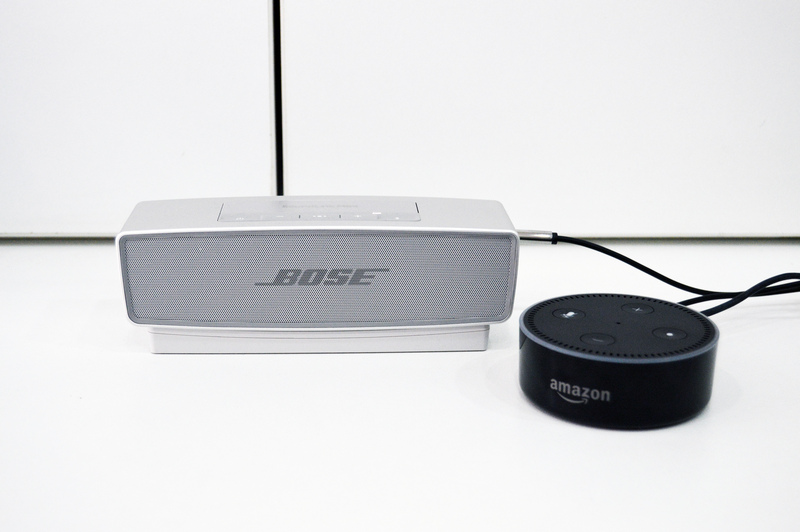 Part of what seemed like a quick success is due to the Echo Dot, the smaller cheaper version that you can sprinkle around the house in places where you don't care about excellent sound quality. 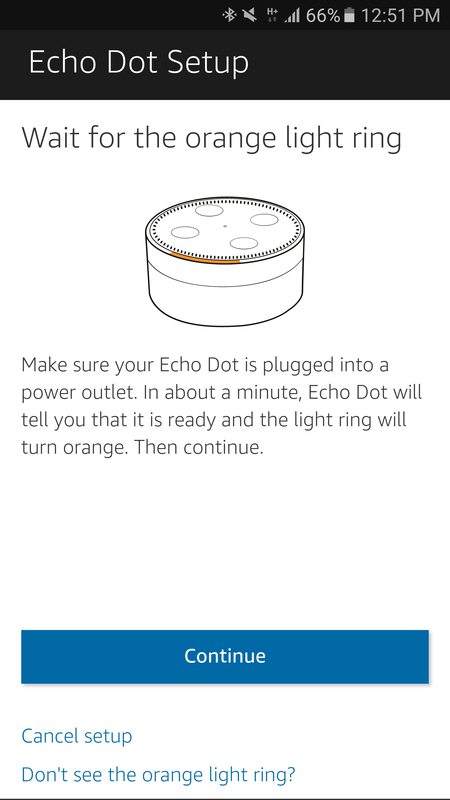 The second generation Echo Dot builds on that. 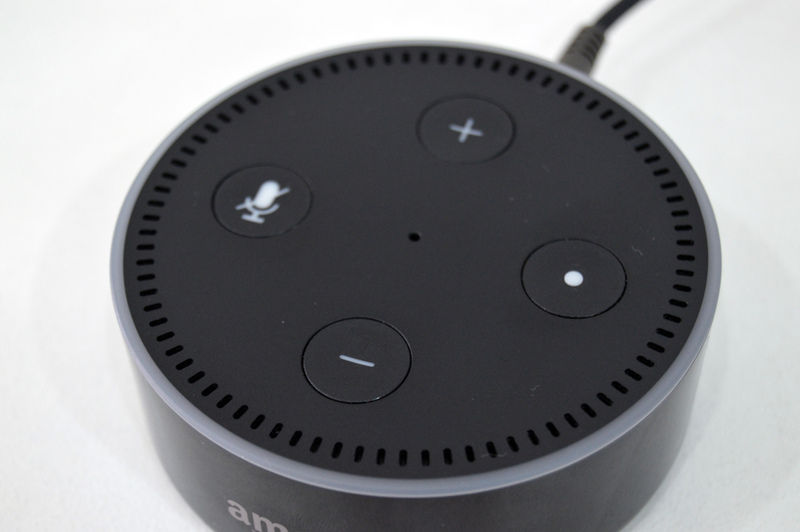 Unlike the first one, you can order it directly from Amazon without having to use another Echo. 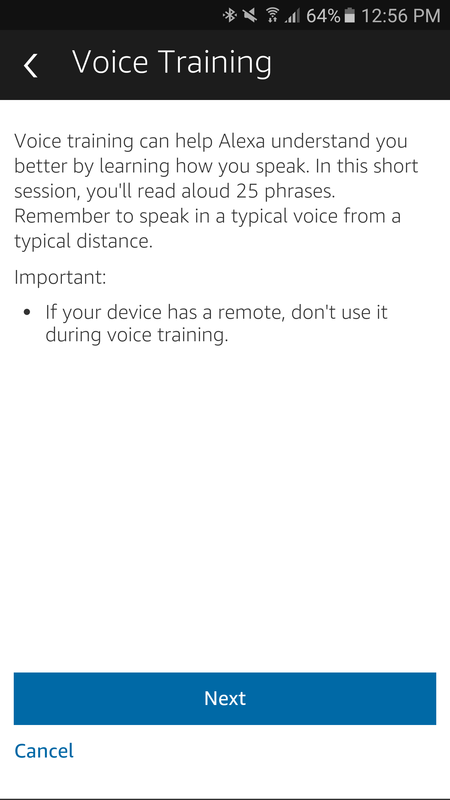 It also has better voice recognition and it's cheaper at $49.99. 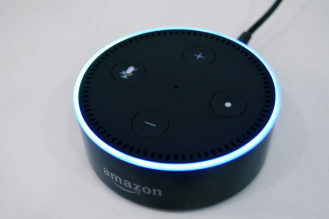 At that price, it isn't hard to imagine grabbing one for the kitchen, a couple of rooms, and maybe even the hallway, especially because thanks to Echo Spatial Perception (ESP), different Echo devices will work together to only answer from the one nearest to the voice issuing the command. 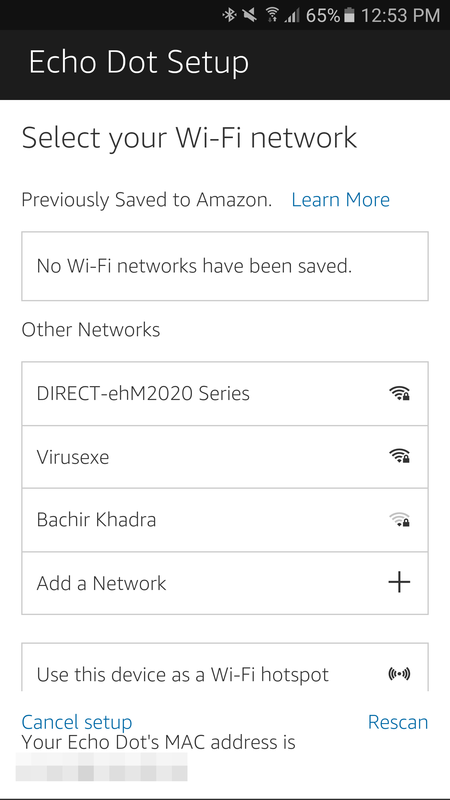 I've had one Echo Dot for more than a month now and I've been able to test it out through different scenarios. The short answer is that I'm impressed and I think it's easily the cheapest way to get into voice-controlled assistance. But before I get on with this review, I feel like I should point out a couple of things. One, I don't have a Google Home device yet (I'm getting one soon), so I can't compare the two just yet. 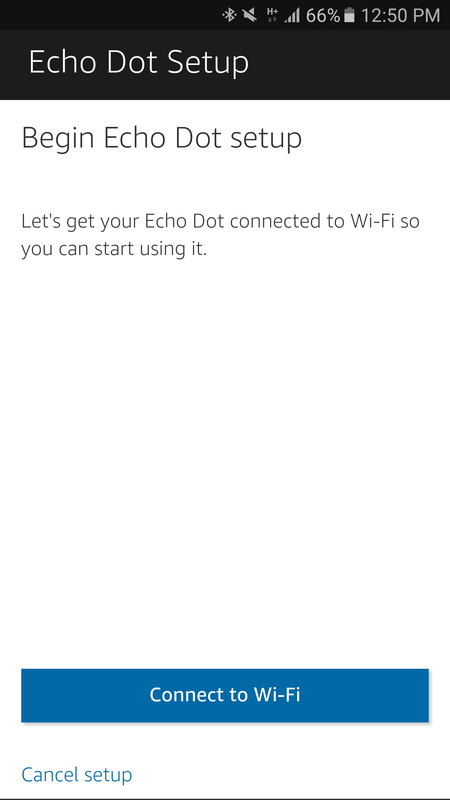 Two, I don't have several Echo devices, so I couldn't test the ESP or see how they work together in a multi-room setup. Three, I'm using the Echo Dot in Lebanon, but it's only available officially in the US, UK, and Germany, so a couple of features didn't work as expected. They're pretty minor, though. And four, yes, I know this is an always-listening device and there are lots of privacy concerns about this kind of technology. I don't have an answer or excuse for that. I guess you either decide the convenience is more important to you than the small risk of potential misuse, or you don't. That's your choice and I'm not about to try to convince you of my point of view. Price At $49.99, this is in impulse-buy territory. 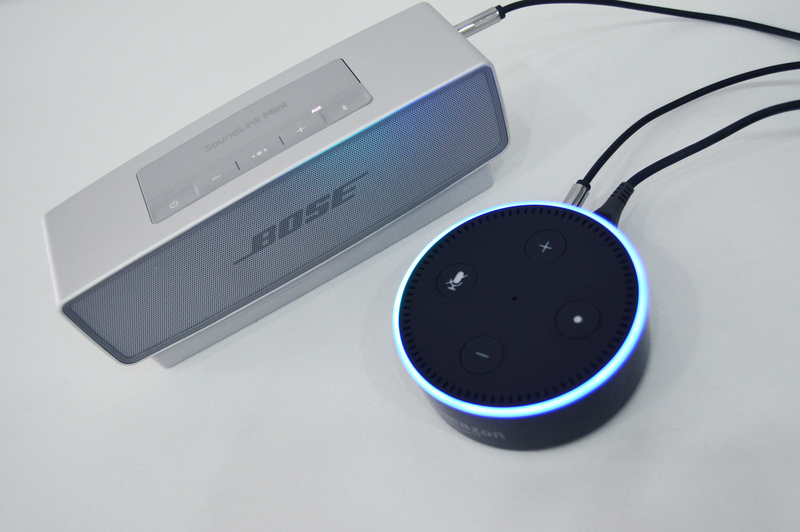 Bluetooth input and output You can use the Echo Dot as a speaker for your phone, or send audio from the Dot to another speaker via Bluetooth. 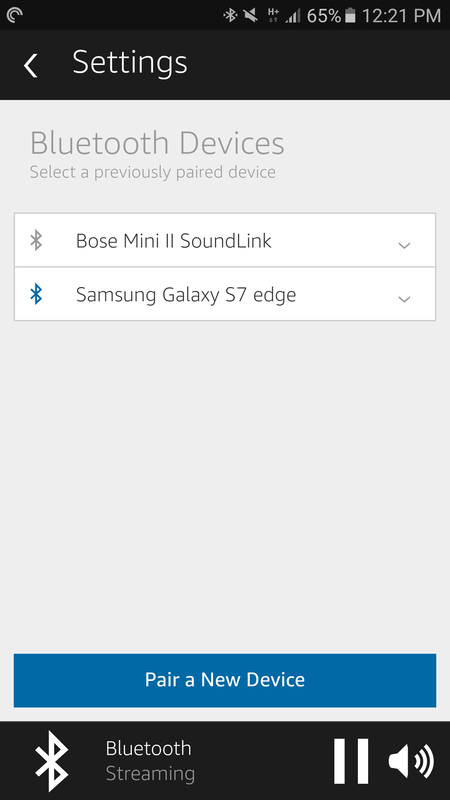 You can also control Bluetooth playback coming from your phone with audio commands. Standard ports MicroUSB and 3.5mm plugs are used for power and audio-out. No need for any proprietary cables. Color LEDs When it's listening, playing, muted, or in any state, the colored LEDs are cool. Great microphone It picks up my voice from across a 450sqft room, without shouting. Decent sound For its size, the Echo Dot makes a surprisingly decent desk speaker. Mute button Stop the Dot from listening to you whenever you need some privacy. 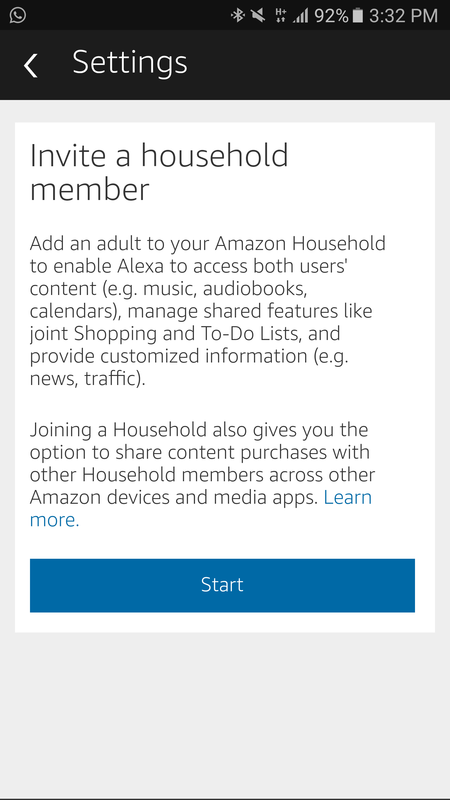 Family friendly Adding household members lets you benefit from everyone's media collection and manage joint to-do and shopping lists. Versatility Use it as Bluetooth speaker, a connected WiFi speaker, a voice controlled assistant, or a music streaming "stick" connected to a bigger speaker. Alexa skills Thanks to IFTTT and first-party Alexa integrations, it's easy to get plenty of hardware and services to play nice with the Dot. Dust magnet bottom The lower side of the Dot attracts lint and dust like a magnet. 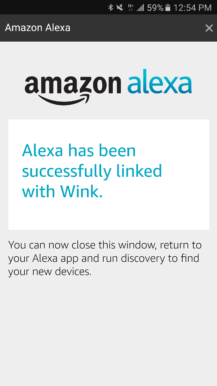 Alexa app It's just a web wrapper. Everything takes way more time than it should were the app native. 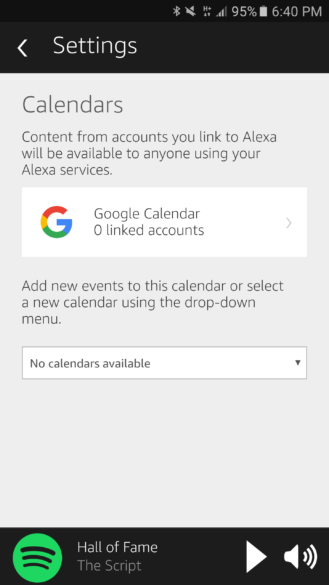 Triggers but not actions You can use Alexa to trigger home automation skills directly or through IFTTT, but you can't have Alexa react to something that happens by playing a chime or notifying you of an event. 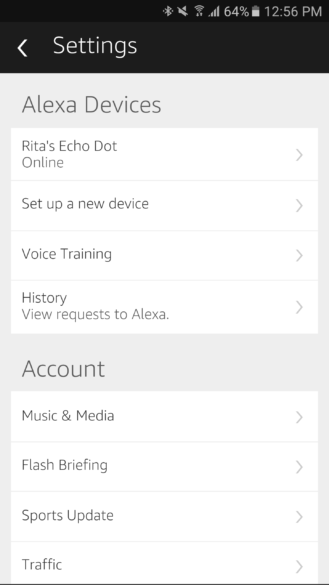 No central Alexa command list There should be a list of commands you can ask your Echo based on the skills you have enabled, instead of checking each skill separately to see its possible commands. 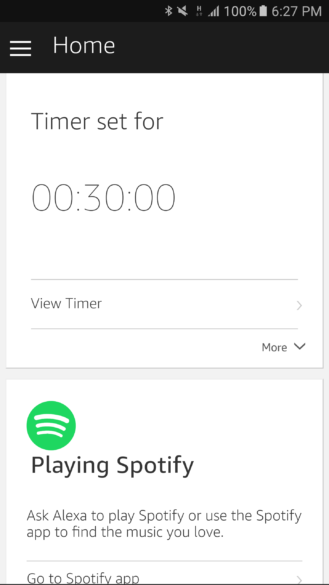 Timer audio is the same All timers play the same audio cue when the time is up, so if you set several ones, there's no way to know which one is up. 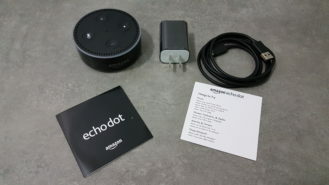 The second generation Echo Dot ships in a small box that's about the size of the Dot itself, with a charger, a MicroUSB cable, and a couple of manuals. 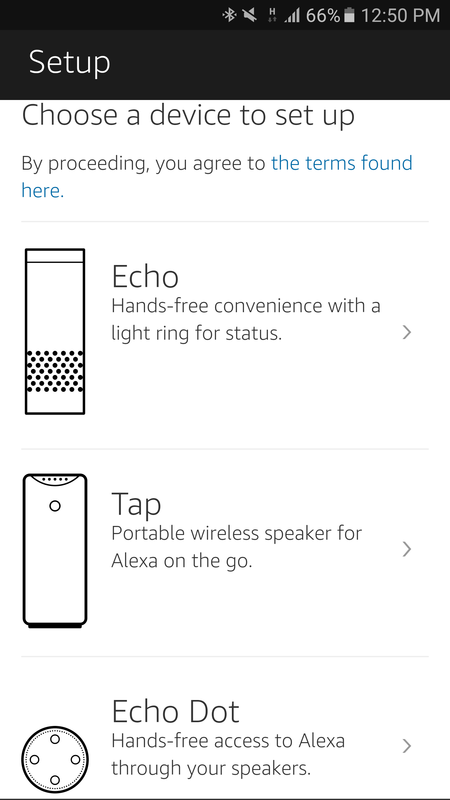 The Dot is a short cylinder that looks more like a puck than a speaker. It's 3.3" wide (approx. 8.4cm) and 1.3" tall (approx. 3.3cm) so it's very easy to blend it in any décor, whether it's a desk, a console, a countertop, a beside table, or any other setting. The top houses the buttons: volume up and down, mute, and an action button to trigger Alexa on demand. It also has the openings for the 7-microphone array and speaker. The colored ring that lights up is all around the top's circumference. The sides are relatively clean. 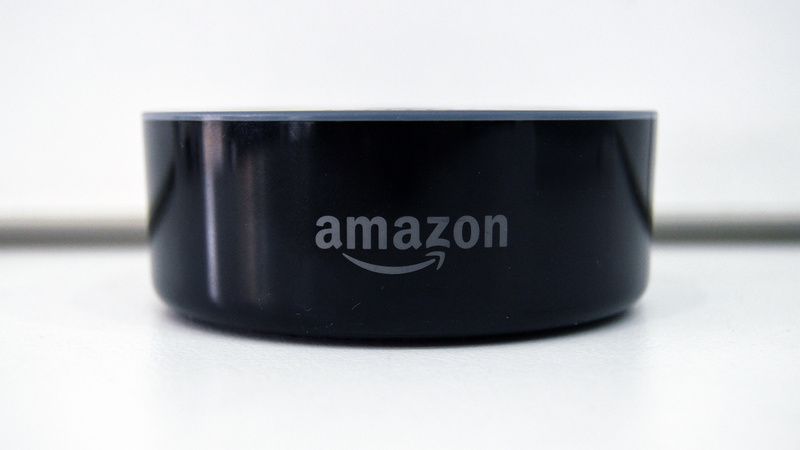 There's an Amazon logo on the front, a MicroUSB and 3.5mm plug on the back. The former is used to power up the Dot, the latter lets you connect it to a standalone speaker if you want more sound power out of your setup. 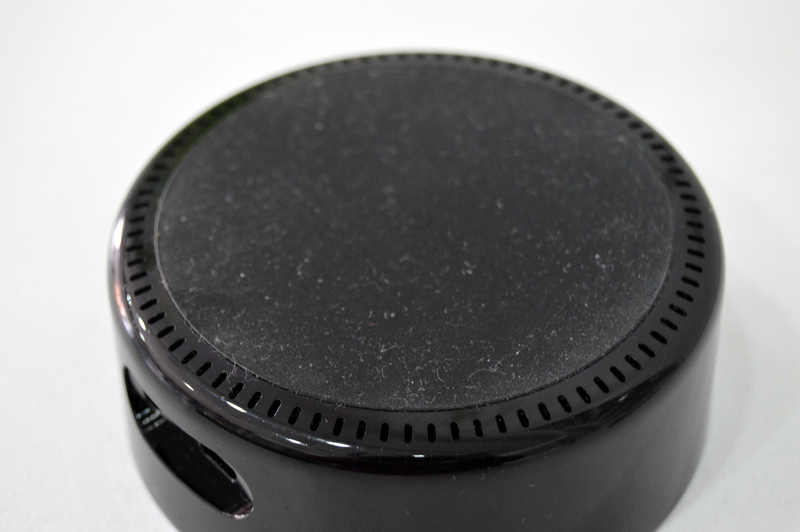 The bottom of the Echo Dot is a rubber material that works well for gripping it to any surface and not letting it slide out of its place. However, it's a huge dust and lint magnet. Good thing you can wipe it out easily with a slightly damp towel. The colored ring on the top lights up with different LED patterns depending on what the Dot is doing. It's red when muted, white when you're manually adjusting the volume, blue with a little bit of turquoise when it's listening, and it rotates blue and turquoise as it processes any query. There are more color patterns, but these are the ones you're most likely to come across. 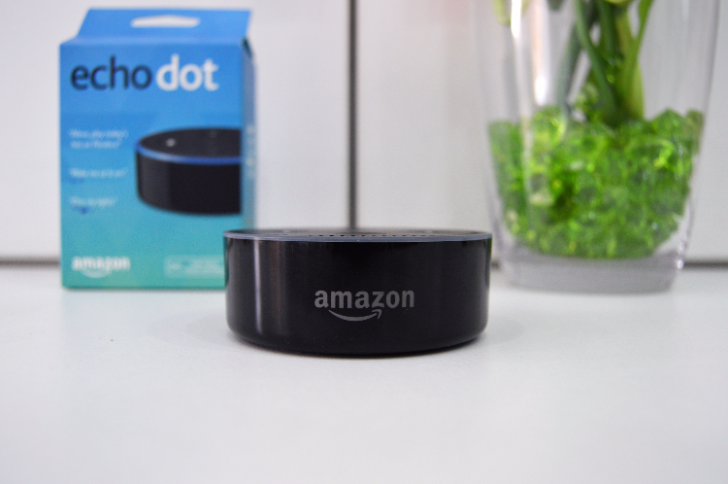 Overall, the shape and design of the Echo Dot are nothing to talk about — and that's a good thing. The colored LEDs are the most flashy part of the hardware and I think they add an air of futurism. The Dot doesn't look or feel flimsy, and it doesn't attract any attention. The size is appropriate for what it is being marketed toward (namely small rooms or connected to bigger speaker systems). 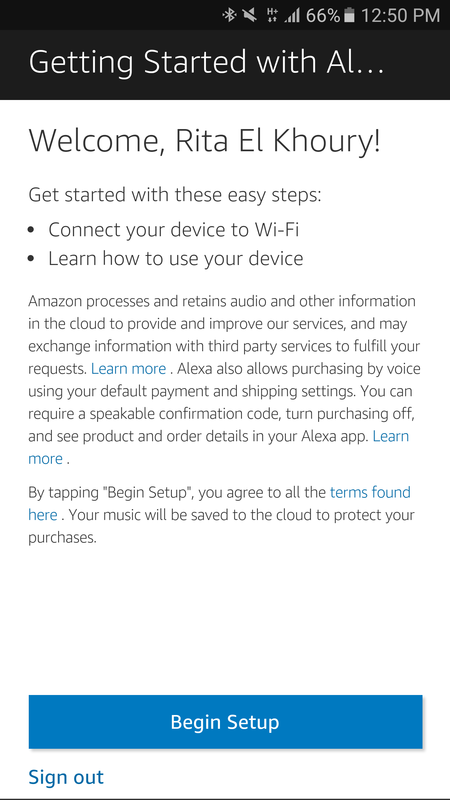 Setting up the Echo Dot second generation involves grabbing the Alexa app from the Play Store, signing up with your Amazon account, adding a new Echo device, and choosing the WiFi network you want the Dot to connect to. Here are a few screenshots from the process. 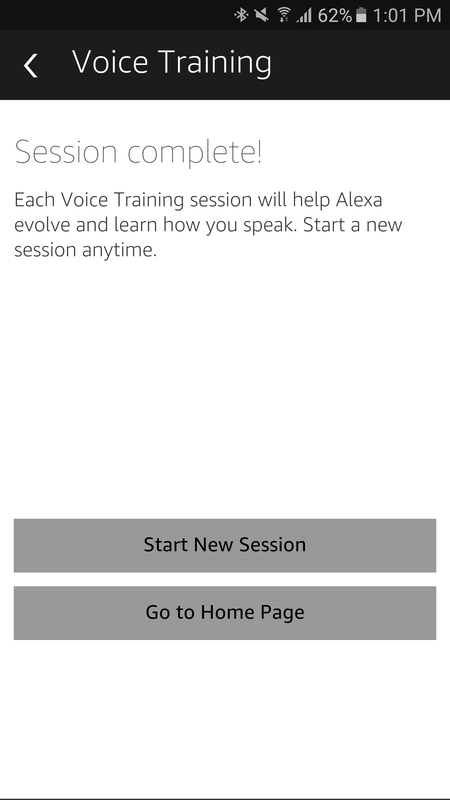 One of the first things you'll have to do once Alexa is set up with your Echo is voice train it to recognize the way you speak. I have an American accent, so I could easily get it to understand what I was saying. For the longest time, Alexa (and thus the Echo) could only understand the US accent, but with Echo devices being sold in the UK and Germany now, support has been added for British English and German. 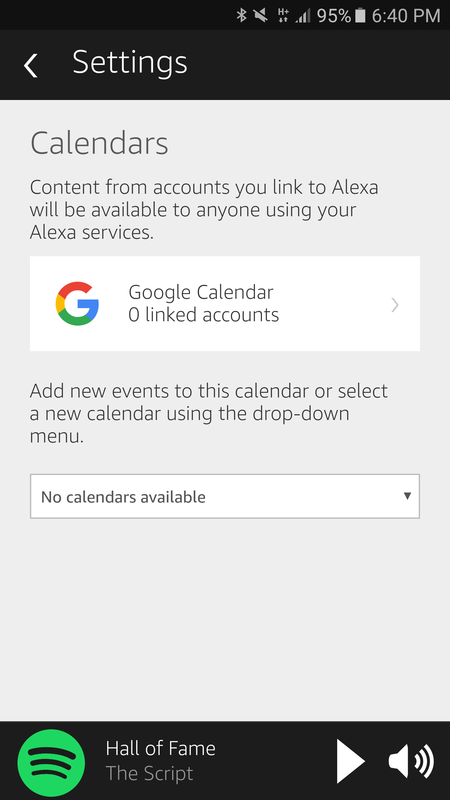 That means more people can get Alexa to recognize their queries. 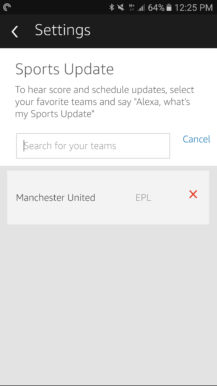 I don't have a lot of trouble communicating with Alexa. 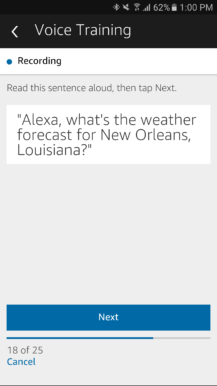 Voice recognition might be faster and a bit more accurate with OK Google, but Alexa is no slouch. Although I suffered through a few false "Alexa" wake-ups, since I speak Arabic around the pharmacy and some phonetic combinations in Arabic can potentially sound like "Alexa," most of the time I was able to trigger Alexa on demand, even from the opposite corner of my store's 450sqft (approx. 42sqm) main room. 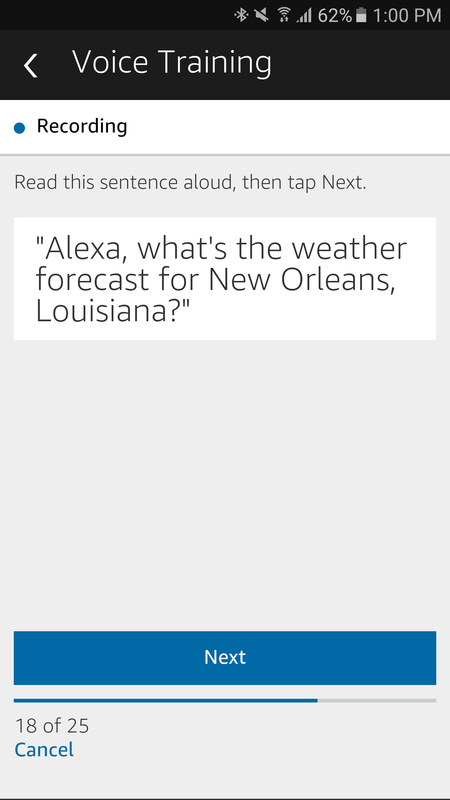 It even picks up what I say when I speak a little louder while inside the adjacent stock room. 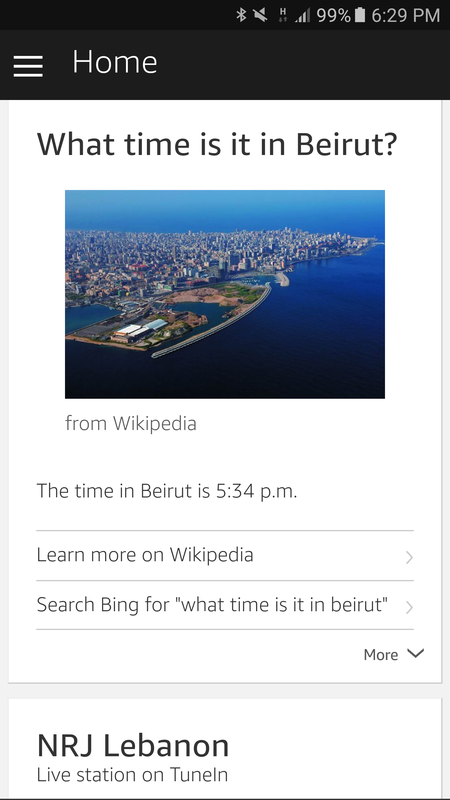 Left: Sometimes Alexa has trouble understanding what I say. Right: But most days, we're good. 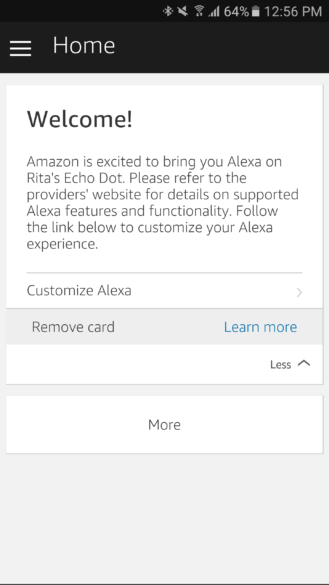 Although most of your interaction with the Echo Dot happens with voice, there's an important text-based component within the Alexa app. 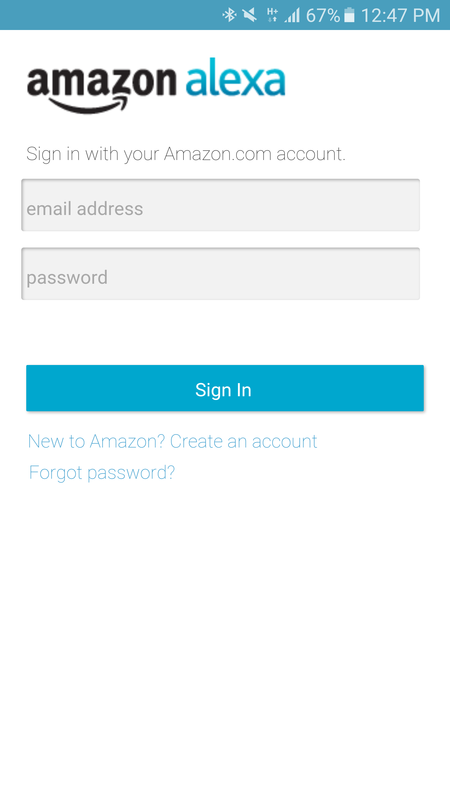 On Android (and based on the screenshots, also on iOS), the app is nothing but a web wrapper. And that's a huge letdown. It takes longer than necessary to do anything, because you're always waiting for a webpage to load. 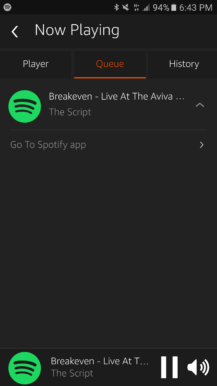 Even on a 4G connection, the app is slow. Opening the menu, switching to another section, changing the settings, adding a skill, any of these take a few seconds too long. I even encountered several instances where the app decided I didn't have a connection, although I was obviously on 4G. Closing and reopening it solved the problem, but that's not an issue that should happen in the first place if the app was native. 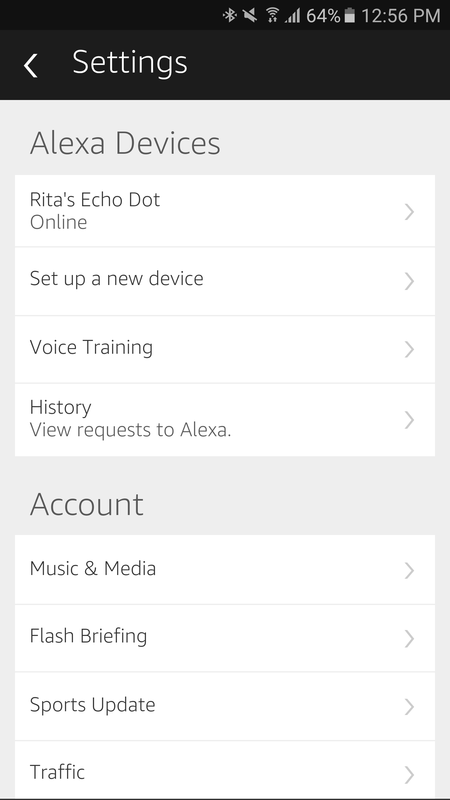 With that said, let's take a look at the Alexa app (sigh, "app" feels weird to say in this case). 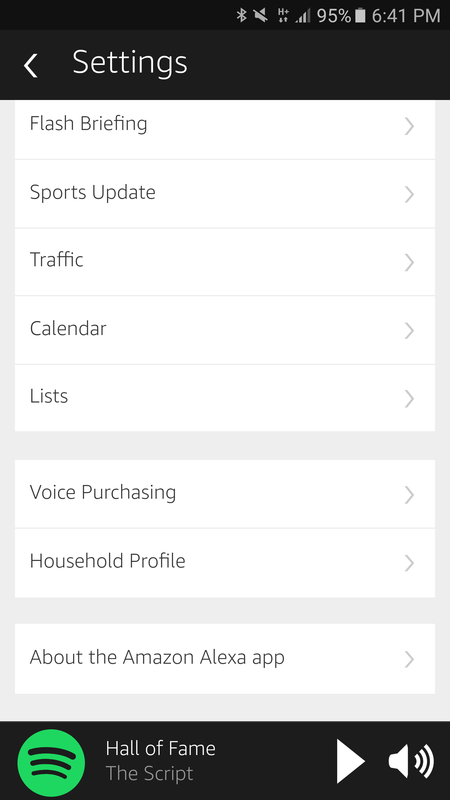 The home page is where you'll find the cards with all of your voice query history and a few hints whenever necessary. 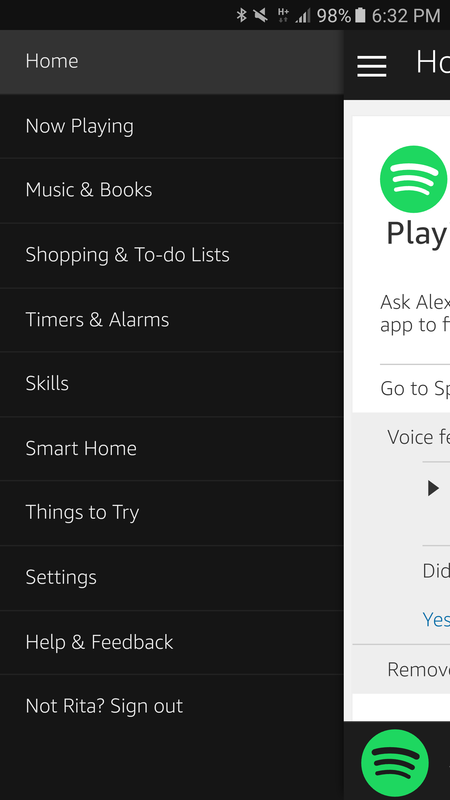 The side menu lets you jump to the different app sections, including Now Playing, Skills, Settings, and the Things to Try list of voice actions to give to Alexa. 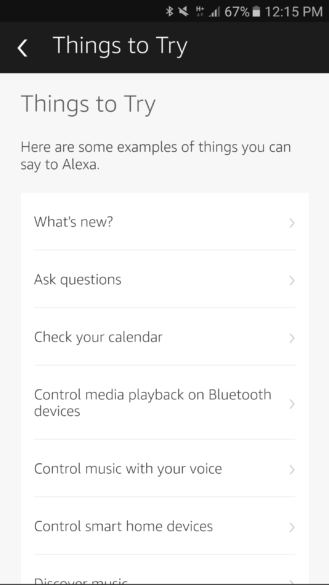 The list of previous voice commands on the home page takes the form of expandable cards that you can use to view more information about your query, delete a specific command from your history, and even revisit should you miss Alexa's answer or not fully understand what she said. 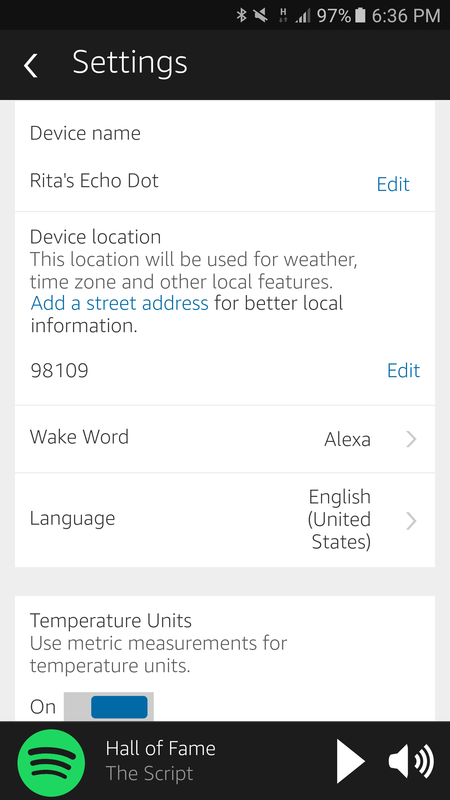 The Settings page is probably where you'll spend the most time in the Alexa app at first. 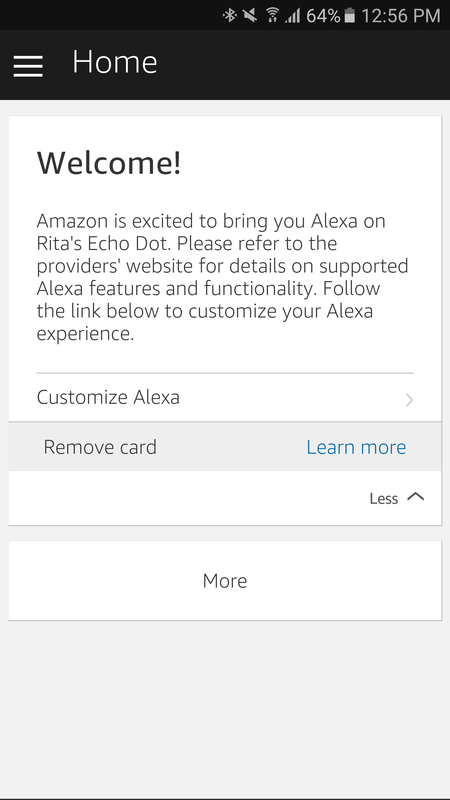 This is where you get to personalize Alexa and the Echo Dot to your liking. It's divided into a couple of sections for the Echo devices linked to your account and then your account preferences in general. Starting with the settings for your Echo devices, there's a lot you can change, including the WiFi network they connect to, pairing a remote, changing the name, choosing an address and location, a default language, the temperature and distance units, and de-registering said Echo device from your account. 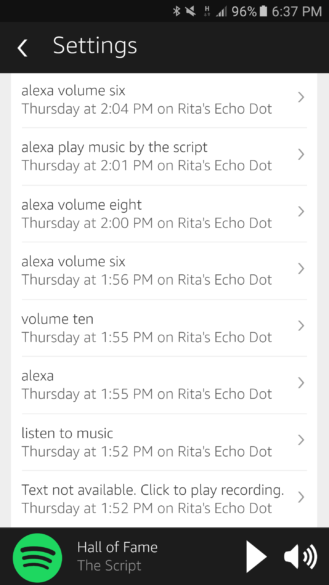 The Echo Dot can get pretty loud if you set it to the highest volume, so I chose volume 7-8 in general for all notifications, alarms, and timers. 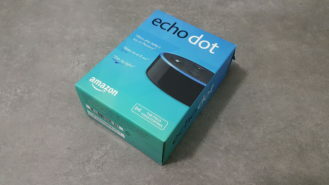 You can make the Echo Dot play a sound whenever it gets triggered and when it stops listening to you, but I turned that off. It can be useful if your Echo Dot is hidden in a cabinet connected to a bigger speaker, or if you're often issuing commands without looking at it, but I placed it on my desk, so I always have line-of-sight access to its colored ring of lights. 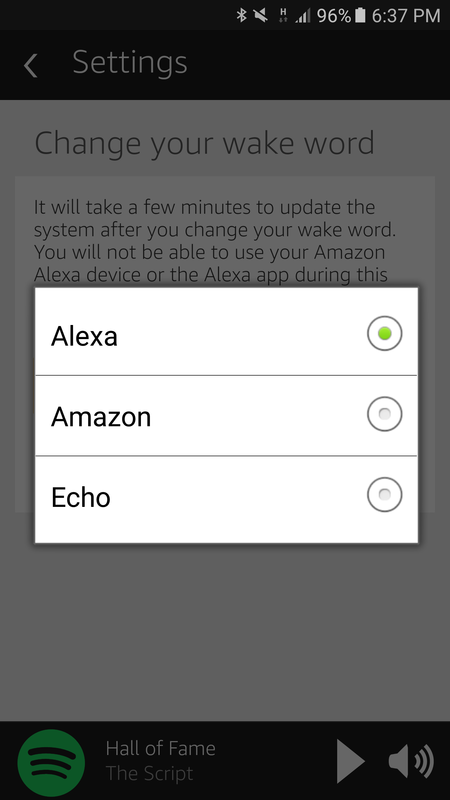 Oh and if you don't like saying "Alexa," you can change it to "Amazon" or "Echo." 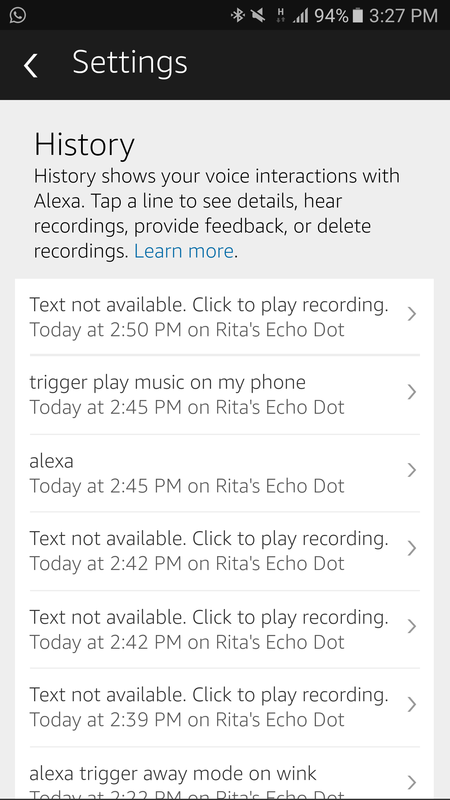 I think Alexa is the most personal, whereas Echo is a bit meta and punny (you say echo and echo answers back, geddit?). Amazon just does nothing for me. 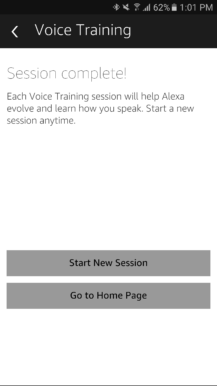 So I stuck with Alexa. Thankfully, that name isn't very popular around here. 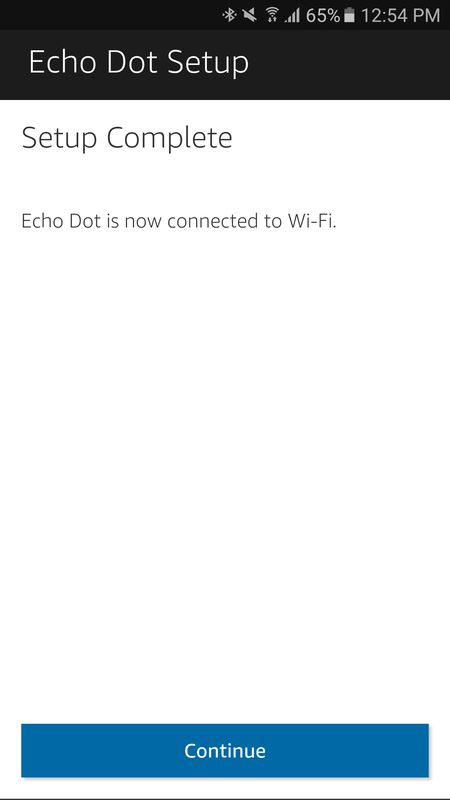 One of the most surprising features of the Echo, I have to admit, was its Bluetooth capability. I knew it had Bluetooth support, but I wasn't sure what to expect. Turns out that you can both receive and send audio via Bluetooth, which means that you can use the Echo Dot as a speaker for your phone, or send audio wirelessly from it (Spotify, Amazon Music, TuneIn, etc) to another speaker. 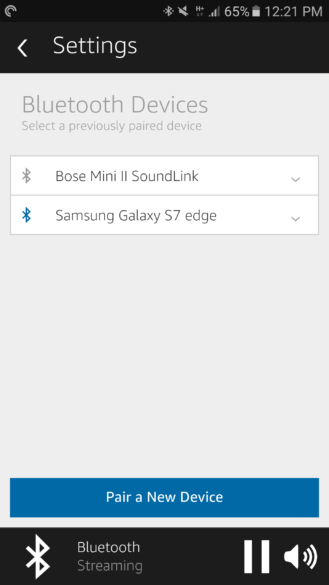 Receiving audio from my S7 Edge, but it can also send audio to the Bose SoundLink. Thanks to this, the Dot became an impromptu desk speaker for my phone. I love listening to music while I work, so when the source is local music or Google Play Music, I can easily say "Alexa, connect to my phone," and the Echo will find my S7 Edge and start playing the music coming from it. 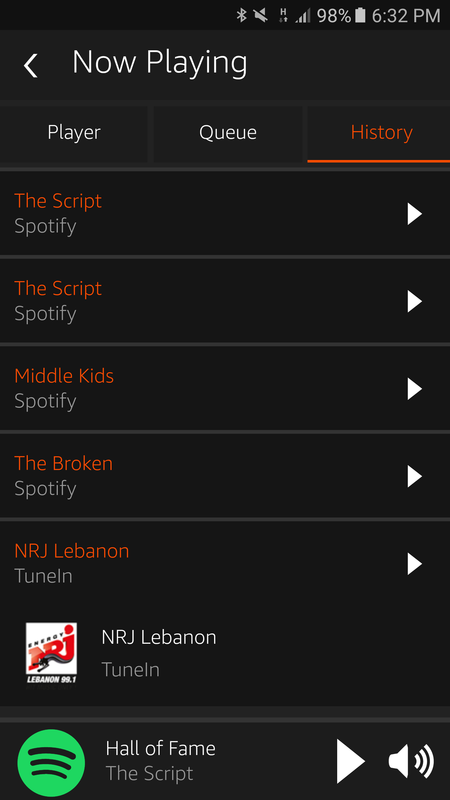 The awesome thing is that I can control playback with voice commands too. 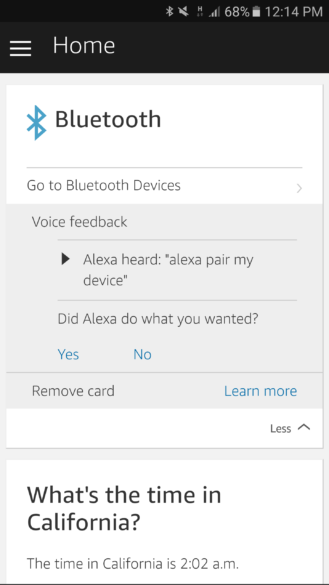 "Alexa, pause," "Alexa, volume 6," "Alexa, play," "Alexa, next," they all work with Bluetooth audio coming from my phone, regardless of the app being used. 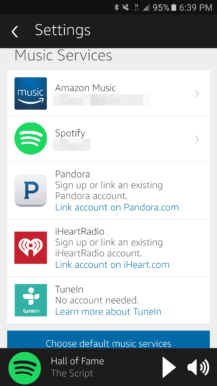 I tested it with locally saved podcasts on Pocket Casts, and streamed music from Google Play Music and Spotify. Surprisingly, this feature makes the Echo family one of the best Bluetooth speakers/receivers for Android devices. 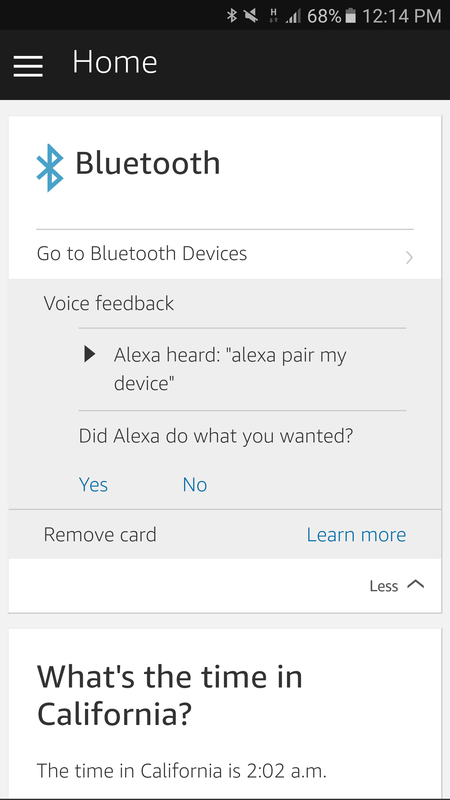 I can imagine someone buying a regular Echo or connecting an Echo Dot to a more powerful speaker via a 3.5mm cable, and using them as voice-controlled Bluetooth speakers for their Android phones. 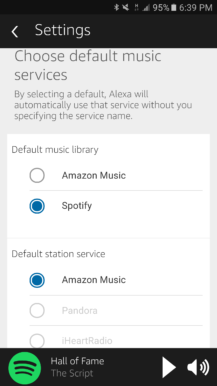 Back to the Alexa service settings, you can choose which music services and list managers you prefer. 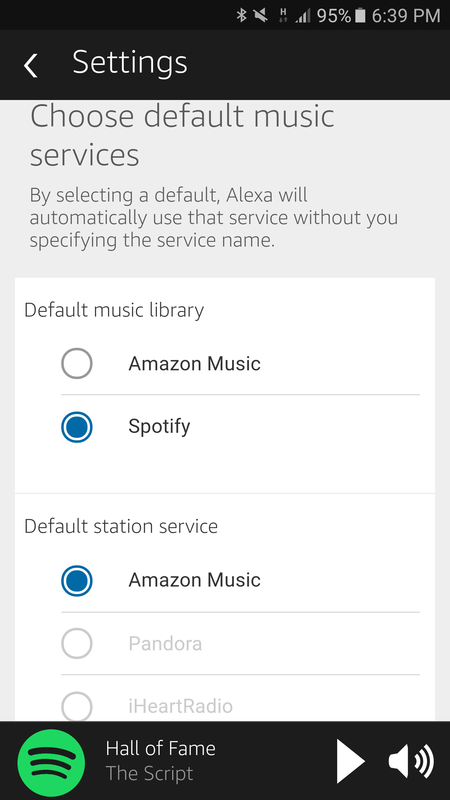 Amazon Music, Spotify, Pandora, iHeartRadio, and TuneIn are supported directly on the Echo devices (the last one doesn't require an account), and you can pick a default service between them all, which is cool because I don't feel like specifying "on Spotify" each time I issue a music playback command. As for task managers, Amazon can manage your to-dos and shopping lists by itself, but you can also integrate with Any.do or Todoist. As an avid user of the latter, I immediately jumped on that. 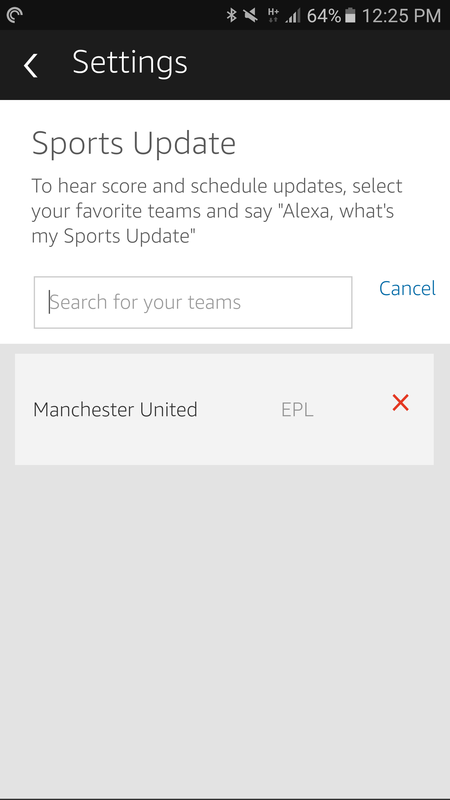 Plenty of other things can be customized with Alexa. 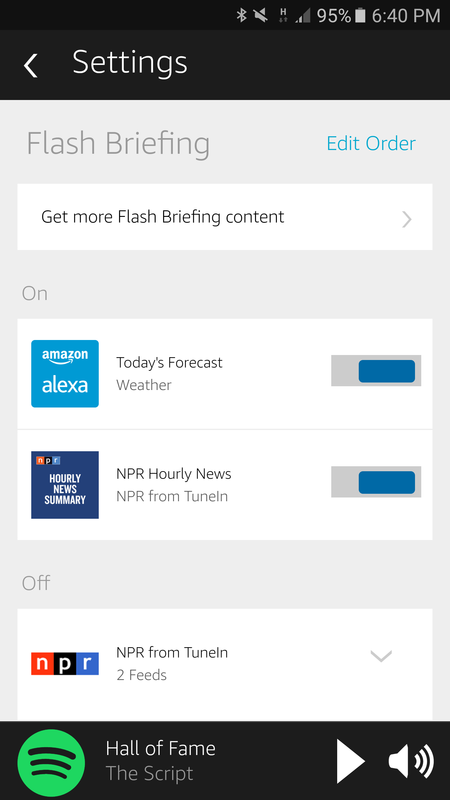 You can choose a calendar provider, different sources of news for your daily flash briefing including NPR, the weather, and more. 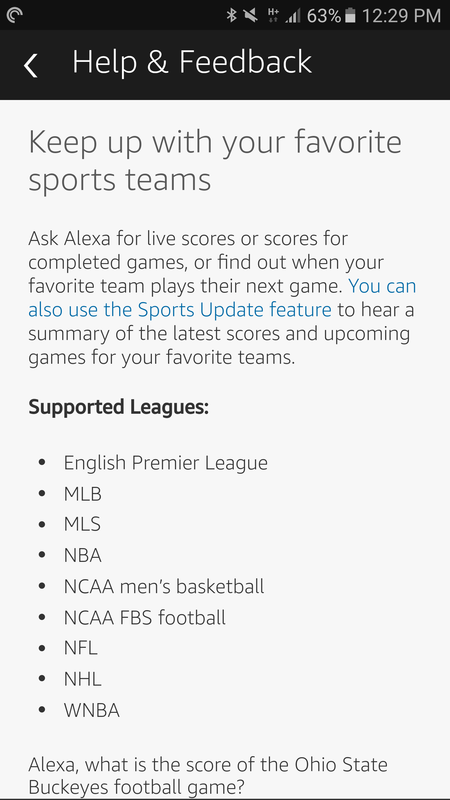 Alexa also lets you follow your favorite teams from a few supported leagues. Most of them are American, given that the Echo family was officially available only in the USA for a long time and has just crossed the pond to the UK and Germany. 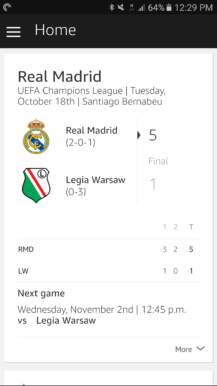 Adding a team from an unsupported league - say Real Madrid from La Liga - doesn't work, but Alexa might answer a few questions about that team if it's also playing in a supported league (Champion's League). 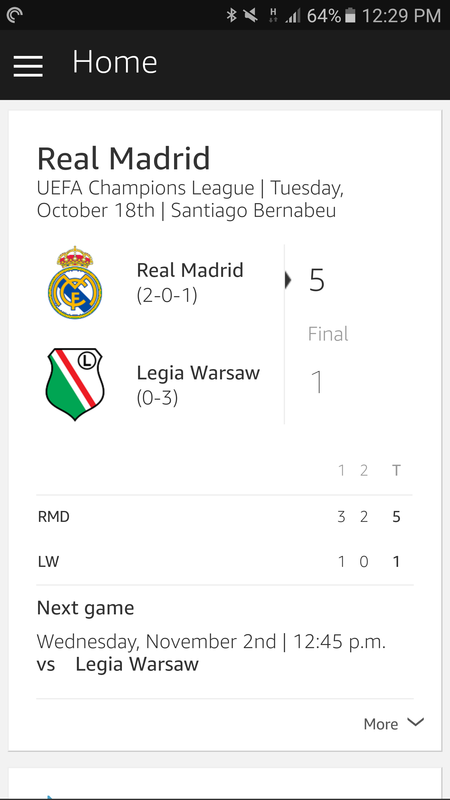 Can't you live in the US and follow Barcelona? Or be in the UK and love Inter Milan? Ugh. Amazon really needs to pick up on the team selection. Support for Formula1 and Tennis would also be quite appreciated. 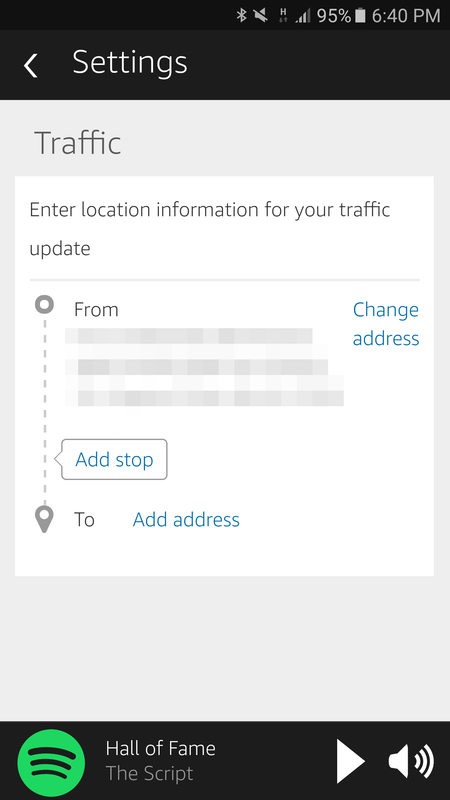 One of the last few things you can change are your addresses for the traffic update and extending invitations to family members to access their media content too and manage joint task and shopping lists. 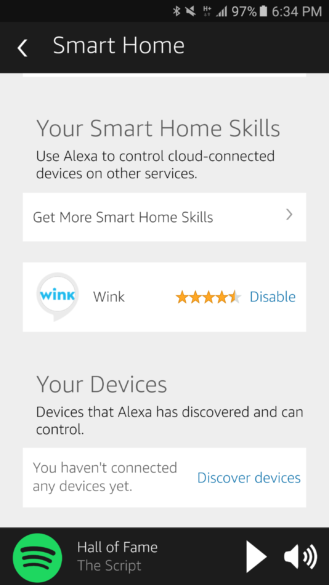 Skills are the heart of Alexa's smarts. 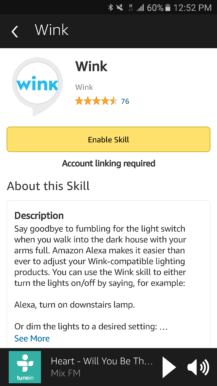 After opening up development to everyone, the number of skills has ballooned significantly and it's been a bit rough to find good skills among all the ones available, so thank goodness for the new full Amazon.com pages that made them easier to browse. 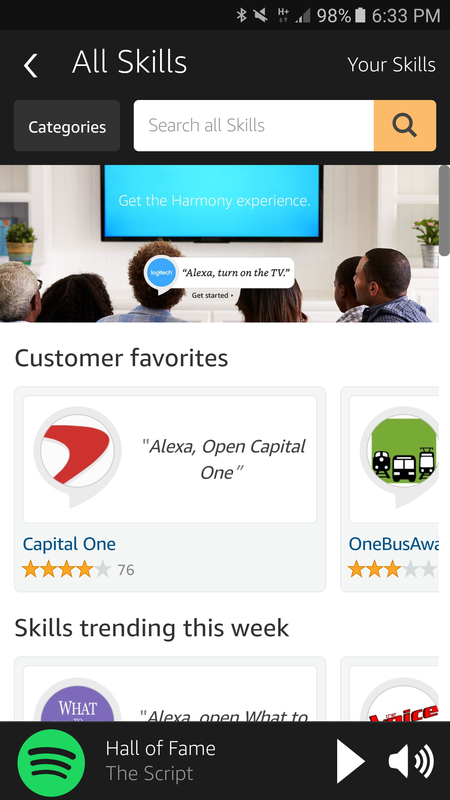 Inside the Alexa app, you can check popular skills, browse by categories, and view the Skills you have activated. 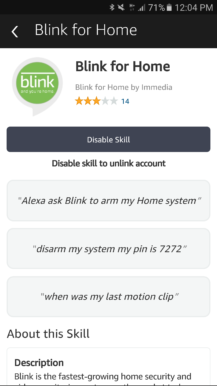 I've linked Alexa to my Blink security cameras, my Fitbit account, my Wink Hub 2, and enabled a couple of other skills like Bartender and Lyrical. Adding a skill is as easy as tapping to enable it, signing in with your account if necessary, and approving the connection to Amazon and Alexa. 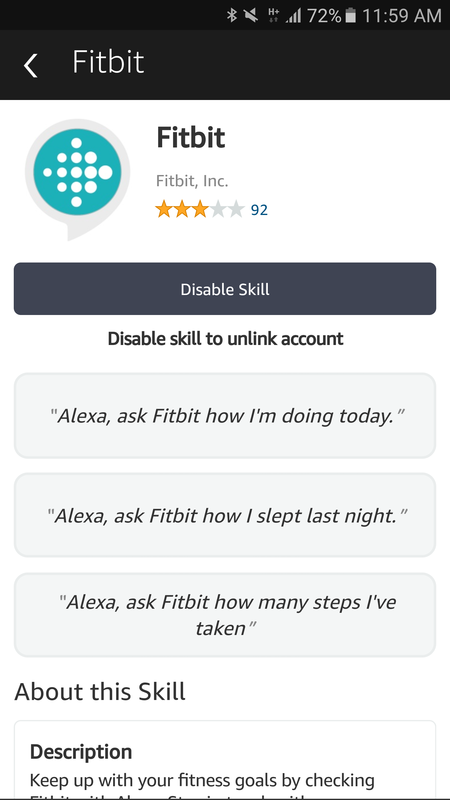 Each skill page inside the app shows you a list of available commands, so you can consult that should you forget what to say to get Alexa to answer you. That page is also where you can disable the command. And whenever you trigger a skill, you get a card in the home feed with Alexa's answer. 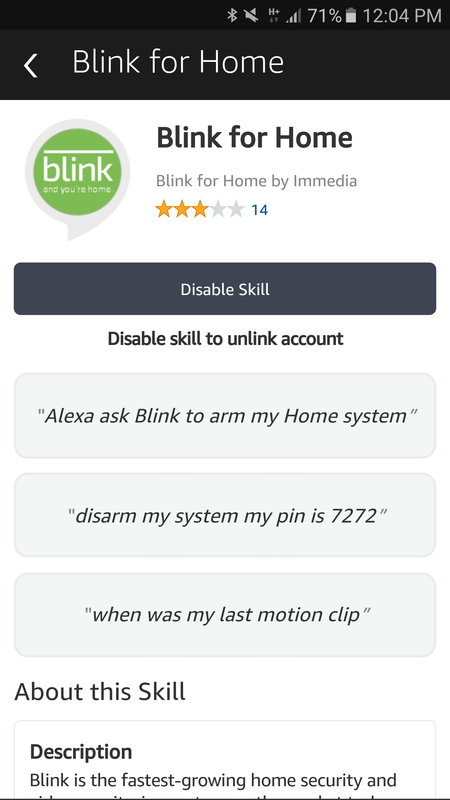 Left & Middle: Blink and Fitbit skill pages. 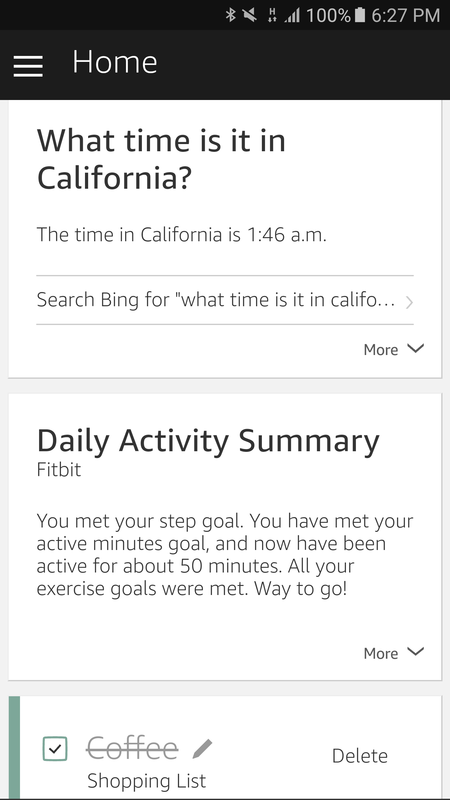 Right: Home card for Fitbit voice query. 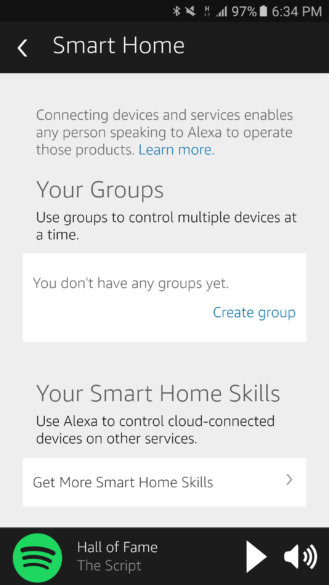 As I used the Dot more and more, and added a few more skills to Alexa, I kept wishing for a centralized list of commands that I can issue to my Dot. Each developer can implement voice commands in a certain way and I had trouble remembering the exact wording of some specific queries, so I often found myself digging into the app, looking for the skill in question, and opening its page to see the command. 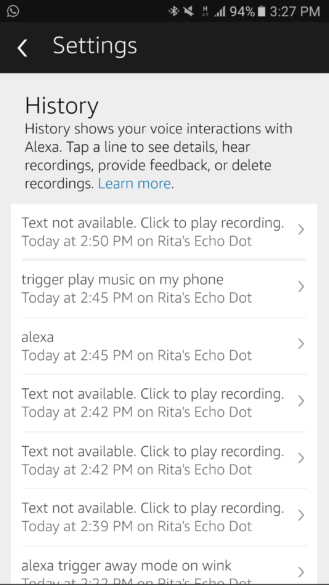 It would be very easy for Amazon to add a central list of voice queries that automatically updates based on what's enabled on your account. 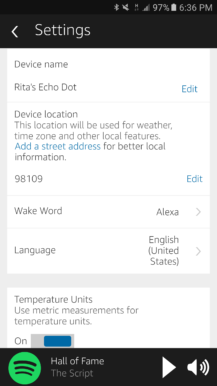 There's also a separate smart home component inside the Alexa app, but it can only control lights and thermostats. 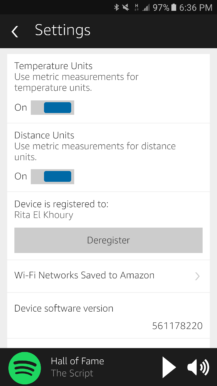 I don't have a thermostat, and I am still waiting for my GE Z-Wave lights to ship from Amazon, so for the time being, I couldn't use Alexa for any smart home automation tasks. 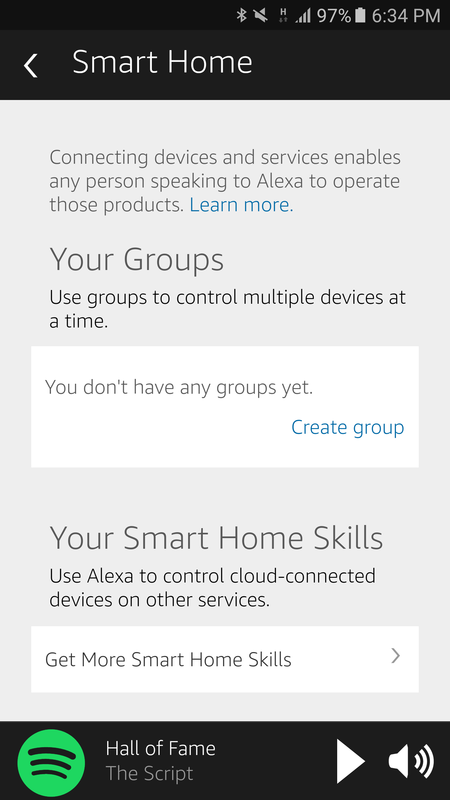 The thing to remember though is that even if Alexa doesn't officially support any smart home devices and groups that aren't lights or thermostats, the IFTTT integration allows you to create any rule to automate any supported gadgets. 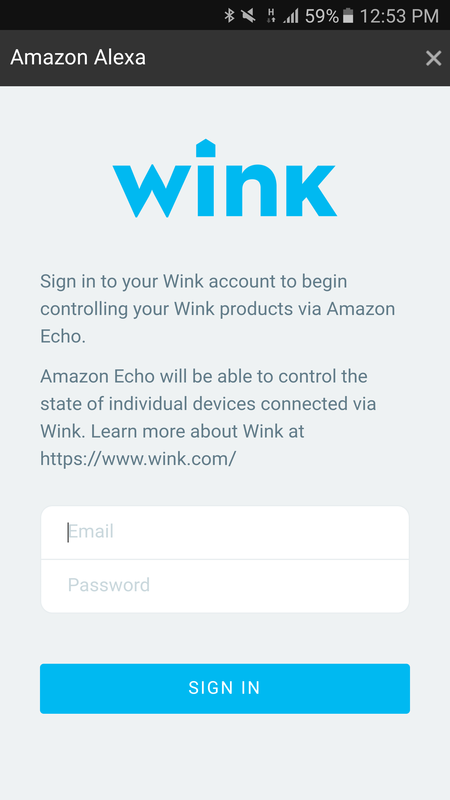 With IFTTT applets, I was able to trigger my Wink Hub's shortcuts via voice commands and even get Alexa to play music on my S7 Edge. There's a lot more to try and discover, I'm just scratching the surface here. 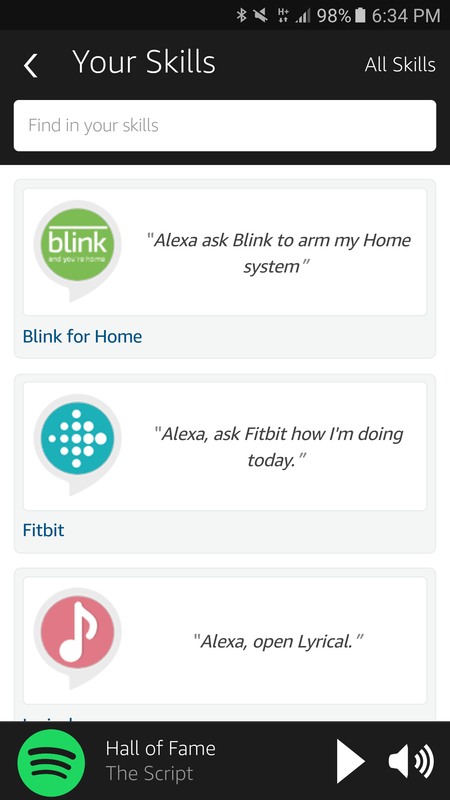 A few IFTTT Alexa applets I've enabled. If you ask Echo device owners, I'm sure many will tell you that they love using their speakers in the kitchen. 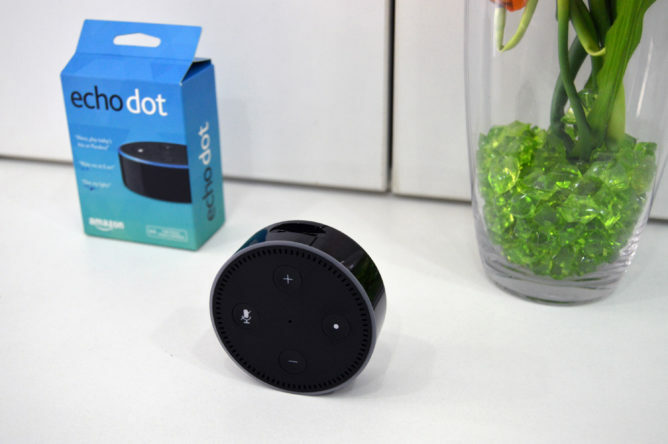 For setting up timers, managing tasks, adding items to the shopping list, listening to recipe steps, and enjoying to music while they work, the Echo and its smaller Dot sibling are just perfect. 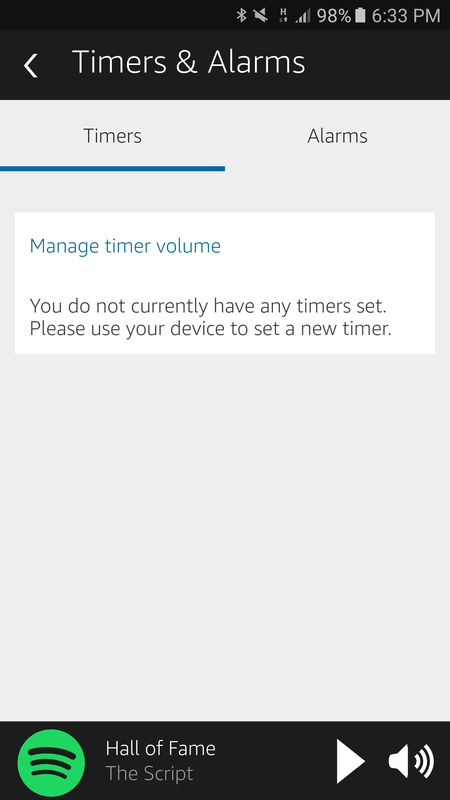 It's very easy to get Alexa to set up different timers for you, but the letdown is that the sound notification at the end is the same. So if you've set 30 minutes for the pie, took a bit of time to prepare the steak and then set 12 minutes for it, you won't know which one is done when the timer rings. Unless you know how long it took you to prepare the steak after setting the pie's timer, you can't tell if the timer is for one or the other. 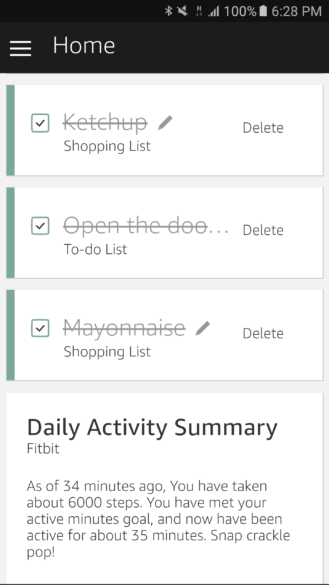 Shopping and task list management is, thankfully, a bit more straightforward. 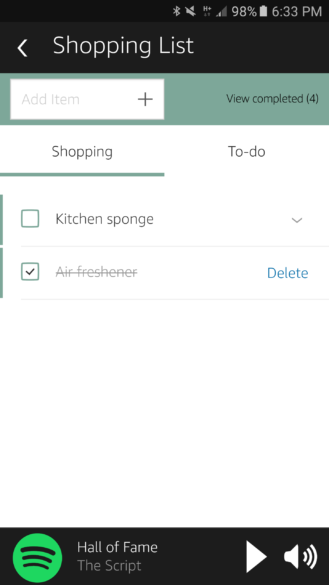 You can rely on Amazon to add and organize things for you, or you can integrate with a service like Todoist or Any.Do. 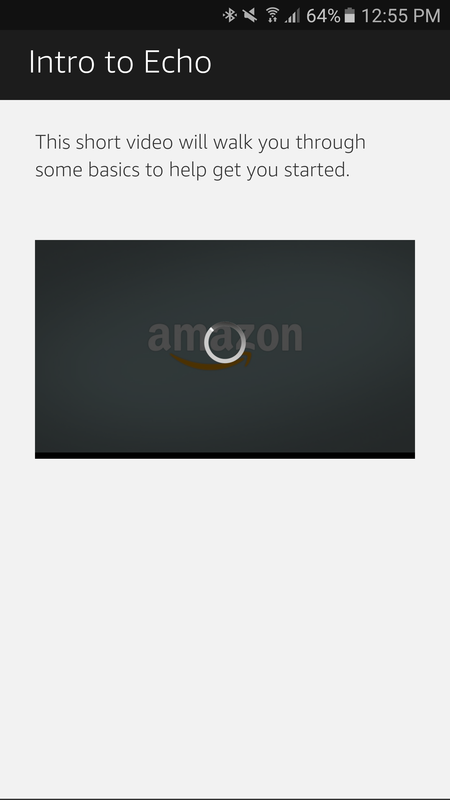 I use the former and I've found it works very well with Amazon. Alexa created a shopping list in my Todoist for itself and any item I add through a voice command gets sent to it. I can mark it as done either in Todoist or in the Alexa app, and the action gets reflected on the other one. 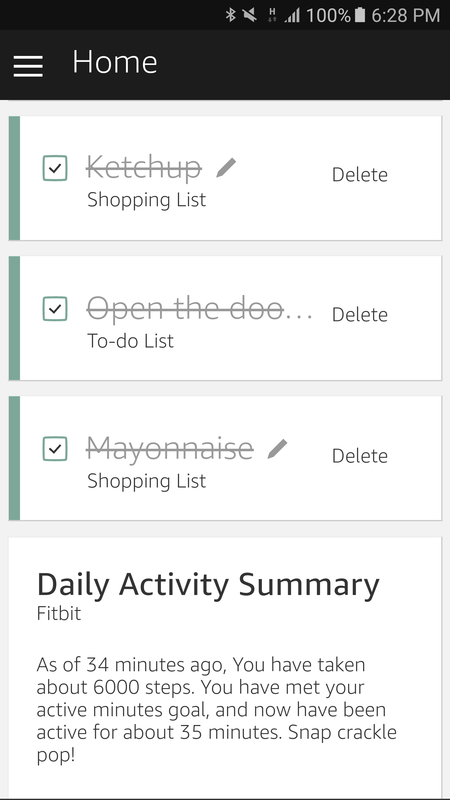 Managing tasks is the same, except they get sent to Todoist's Inbox, and I was happy to see that I could specify due dates in my voice command and Todoist would interpret them well. It's also very easy to use the Echo Dot to stay on top of news through the Flash Briefing, to ask about the weather, traffic, time in different cities and countries if you work with people across timezones, and even get general knowledge info, stay on top of your Fitbit goals, and more. 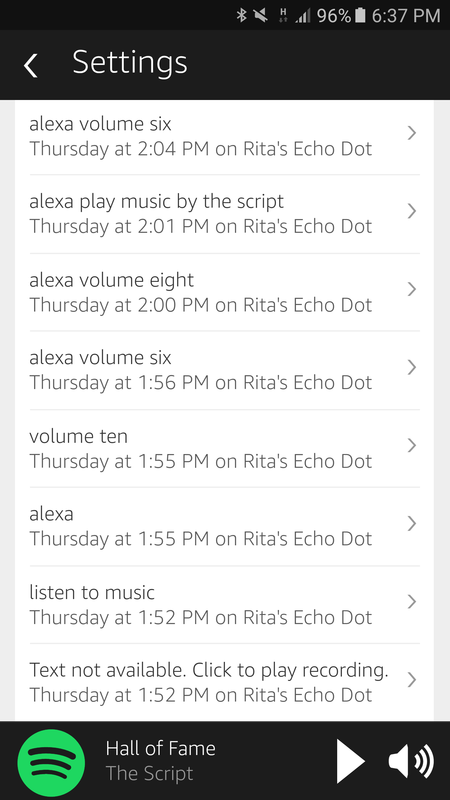 As a full-time voice assistant, the Echo Dot sitting on my desk has been doing a good job of keeping me on task several times during the day. 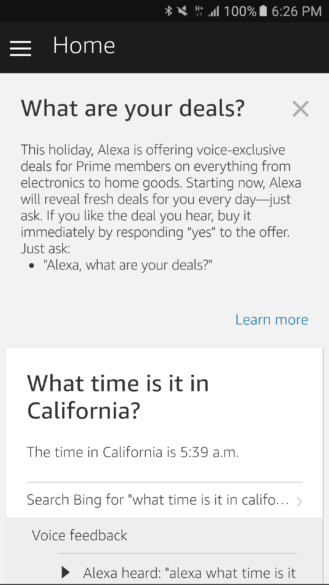 I don't need to interrupt my writing or work to know whether Artem and David are about to wake up, I just ask Alexa what time it is in California. 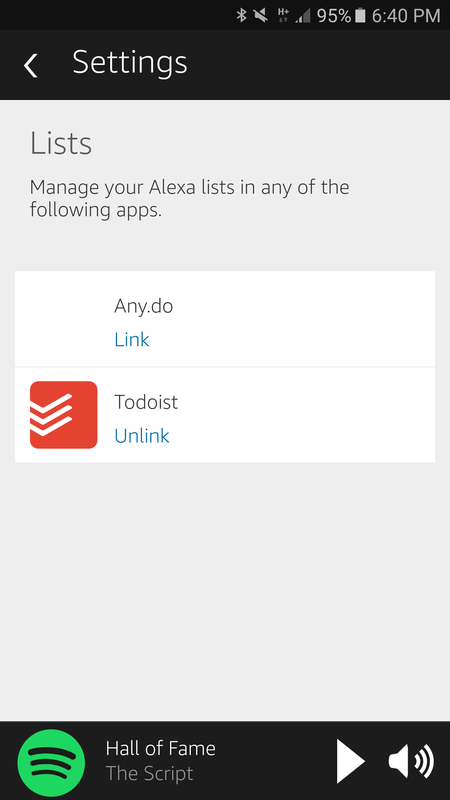 I don't need to open Todoist to add a task that I just remembered or that just popped up, I just ask Alexa to do it. 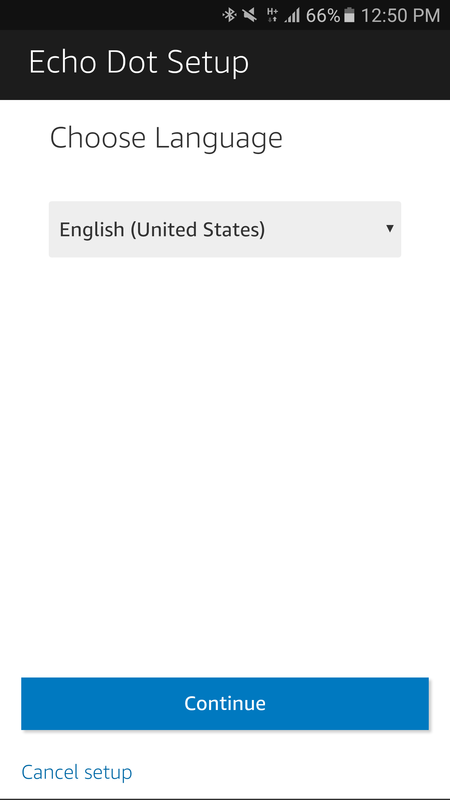 Writing articles about deals or gadget releases in different currencies is a lot easier by letting Alexa do the conversions for me while I keep typing on my keyboard with zero interruptions. And I don't forget hot water brewing on the stovetop for my tea because I just set a timer for 10 minutes and Alexa rings to remind me. 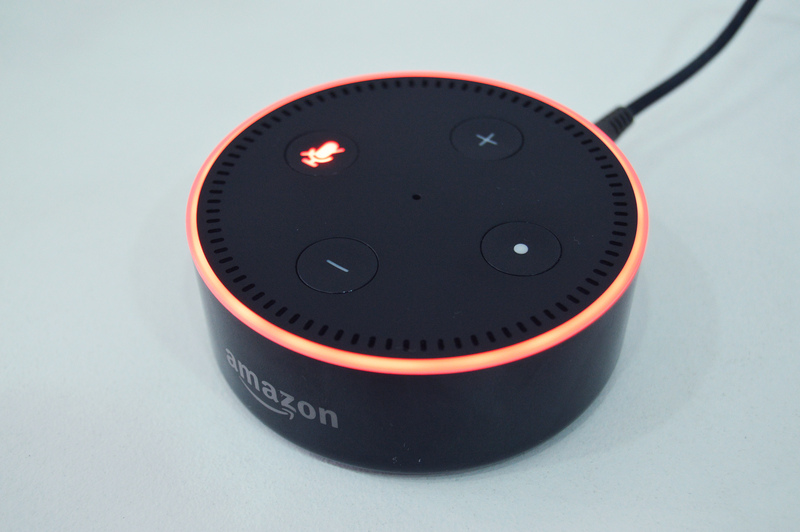 I've already gushed over how oddly convenient the Echo Dot has been as a desk speaker. 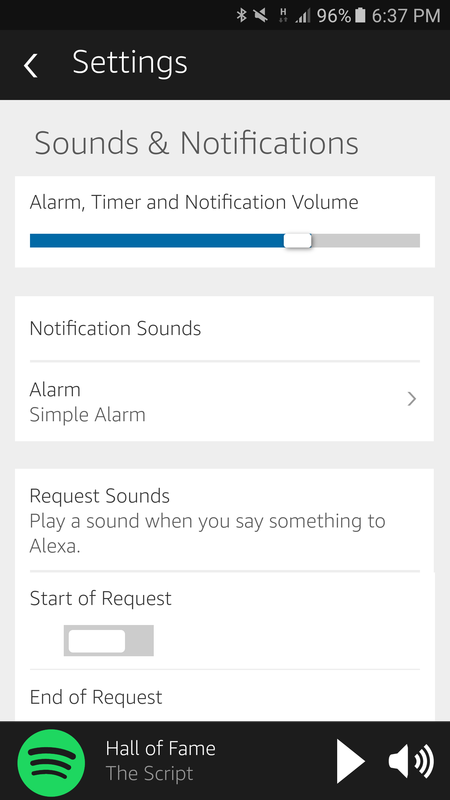 I love telling Alexa to connect or disconnect from my phone so I can play music over Bluetooth from it, but what I love even more is controlling playback by initiating it ("trigger play music on my phone" through an IFTTT command), and then pausing, stopping, handling the volume, and more, all with just voice commands. The Dot has other music capabilities though. 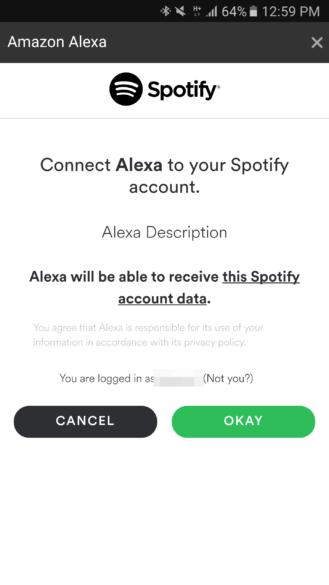 On its own, it can connect to Spotify, Amazon Music, and a few other services. 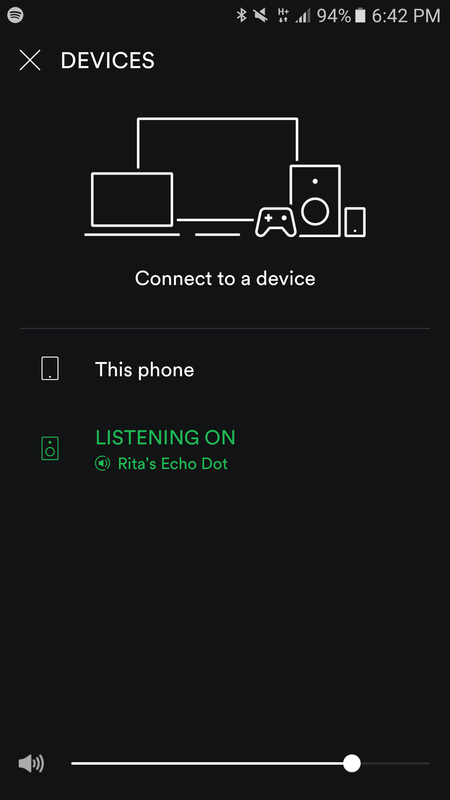 I linked it to my Spotify account and was able to either trigger playback on the Dot directly through a voice command or by sending music to it from my phone thanks to Spotify Connect: the Dot shows up as an available device ready to get in on the action. 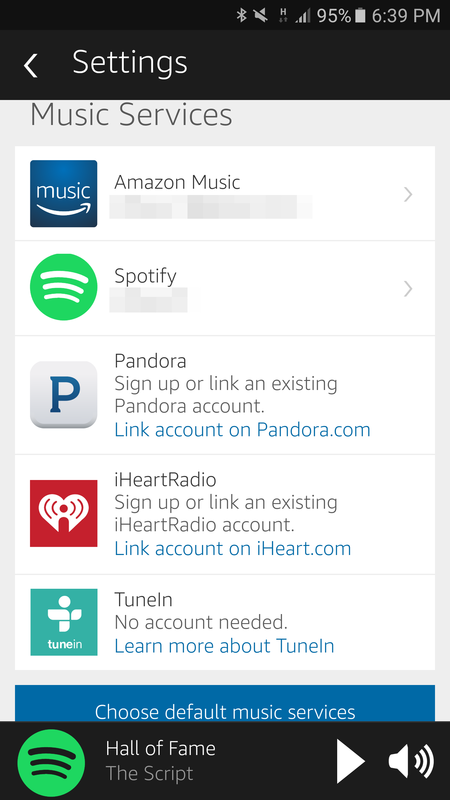 If you don't want to use the Spotify app, the Alexa app has a pretty barebones music player too. 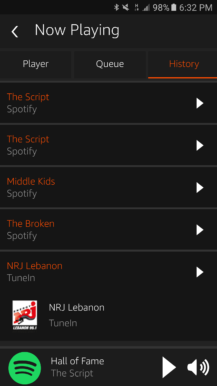 It shows the now playing song, lets you control volume and set up shuffle and repeat modes, and lists your music listening history on the Dot. 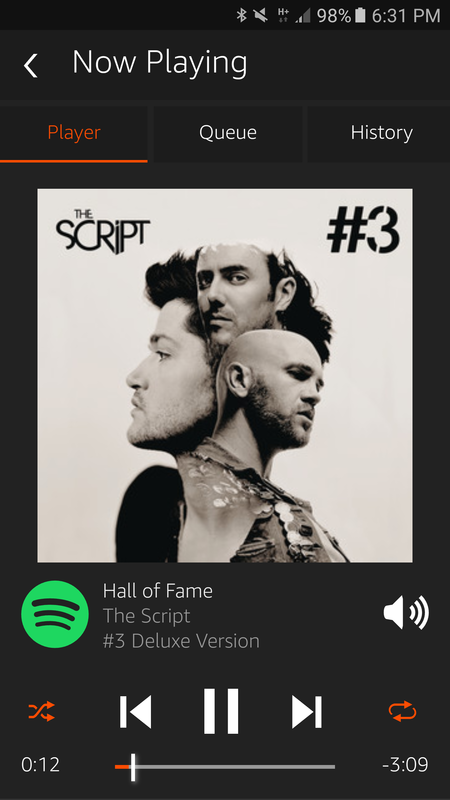 The queue, however, doesn't seem to work with Spotify: you only get the currently playing song. I also love the TuneIn integration, although it has some quirks. 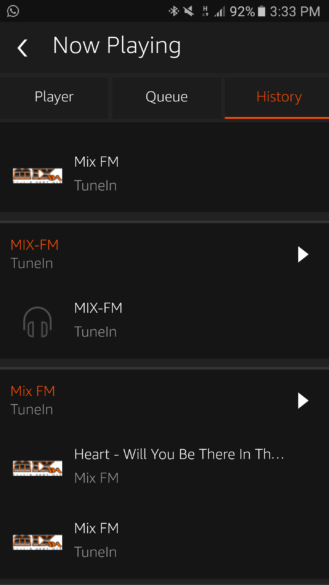 Getting to play local radio stations without a radio felt a bit like magic, especially since I didn't need a TuneIn account and the playback was flawless with nary a break or buffer even when my connection was very slow. 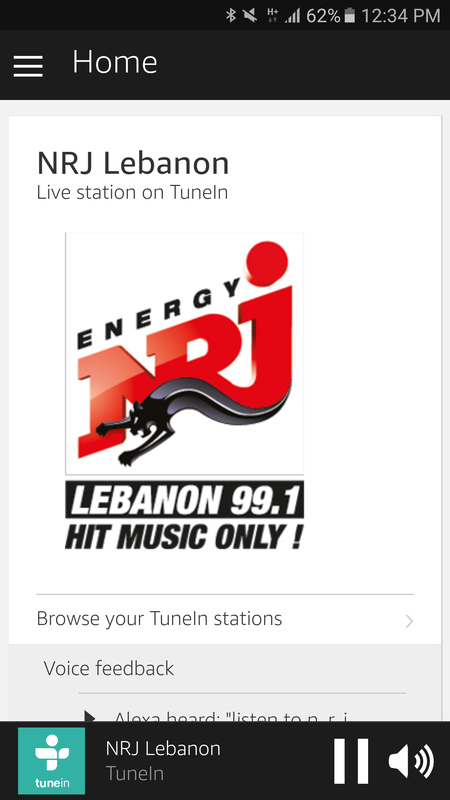 The only hiccup was my struggle to say some station names, specifically ones that have an Arabic name or ones that share the same name with other stations. Alexa had no trouble recognizing "NRJ Lebanon," but there are so many stations named "Mix FM" and no way to tell it which one I wanted. 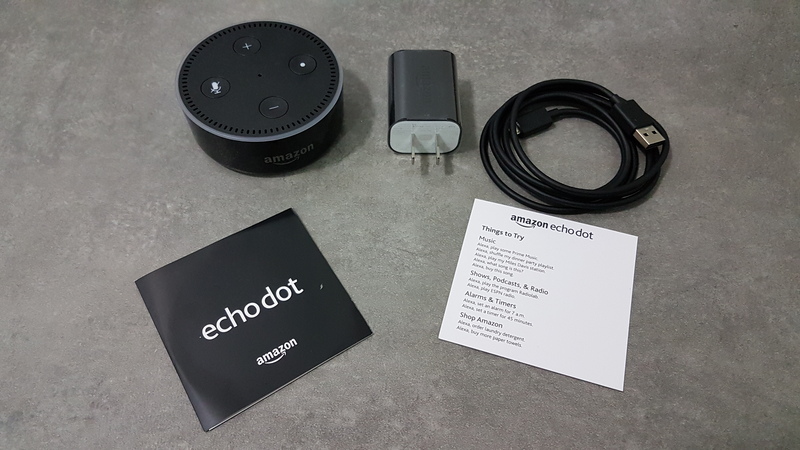 While the sound quality is nothing to write about, the Echo Dot doesn't have anything to be ashamed of. It gets pretty loud and doesn't really distort. It's better than my S7 Edge's built-in speaker and is definitely the most convenient Bluetooth speaker I have used for my Android phones. 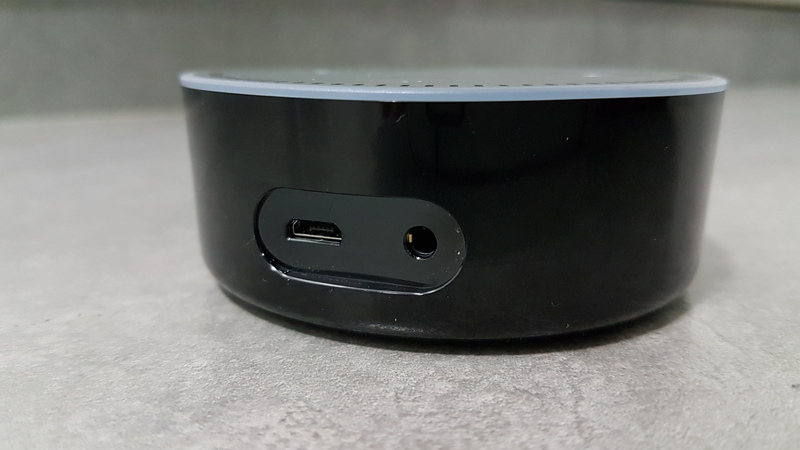 It's also one of the smallest and cheapest WiFi speakers you can buy and a very viable alternative to the Chromecast Audio (thanks to the 3.5mm cable connection to bigger speakers) with voice commands as a bonus. 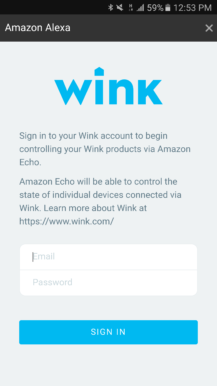 I wasn't able to test the Echo's full ability as a smart home device, but using it with Blink, IFTTT, and Wink, I had a lot of fun at first triggering Away and Home mode on my Wink Hub 2, arming and disarming my Blink system, asking Blink when the last recorded event was, and more. As time passed, I settled into a few routines that made sense to me, the rest feeling more gimmicky. 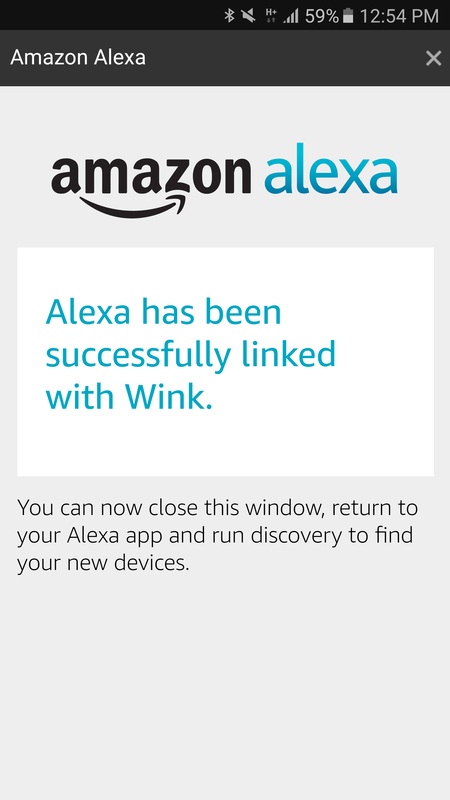 But for now that's not possible, even though it's technically feasible; Alexa can only trigger things and not respond to them. 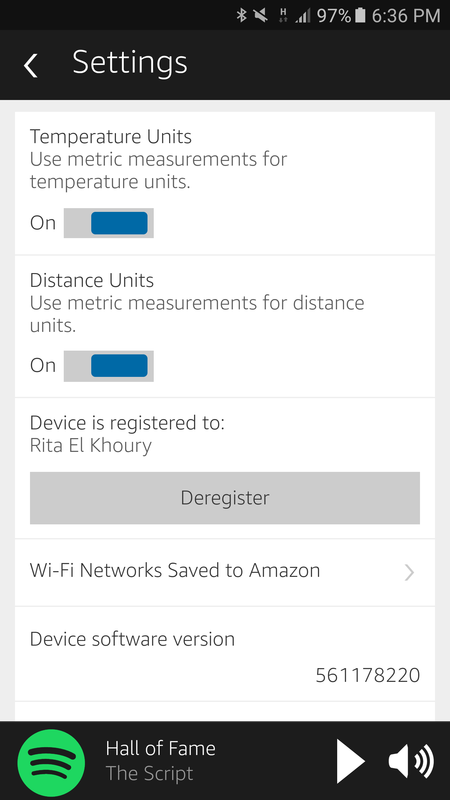 I'm hoping Amazon opens up development further down the line to add these capabilities. Honestly, I wasn't expecting to enjoy the Echo Dot and Alexa as much as I do. It's true that I see a lot of missing features, a few hiccups here and there, and the Alexa Android "app" is a big turnoff, but I keep coming back again and again to one point: this thing costs $49.99. With Black Friday coming up, it'll also be discounted to $39.99, which makes it even harder to argue with the value-for-money proposition. In the kitchen, on your desk, in your bedroom, in the hallway, the Dot can blend and fit seamlessly in any setting, and provide additional value. It's a surprisingly convenient Bluetooth speaker for your Android phone, a good enough WiFi speaker on its own, and a relatively cheap way to smart-up any existing audio system in your house. Alexa has a lot to learn still, but voice recognition works very well, even from across the room, and the number of integrations with other hardware and services makes it even more useful as time passes by. 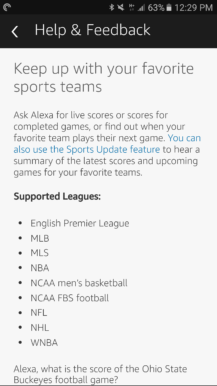 Plenty of companies are rushing to add Alexa support so things are only going to get better.